I’m a huge fan of Stephanie Pui-Mun Law‘s artwork. It has just the right ethereal feel to it, which I find extremely inspiring when writing or revising Synchronicity. In fact, whenever if I’m stuck or feel uninspired, I take just a moment to browse through her galleries and allow myself to be drawn back into the beautiful world of fantasy. 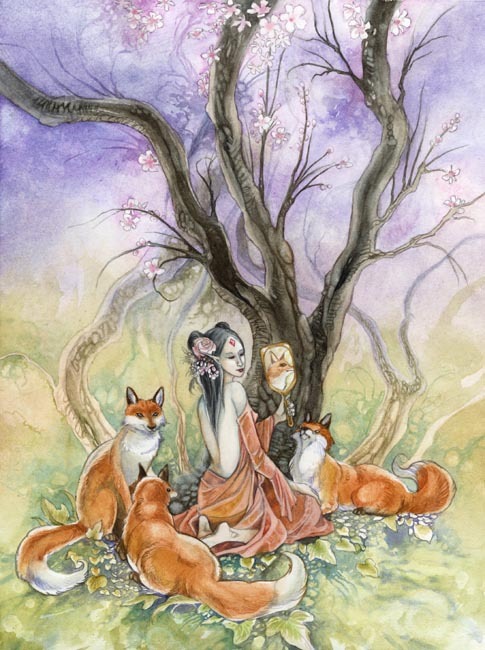 I love this painting because it depicts kitsune (Japanese) or gumiho (Korean) – fox spirits. Fox spirits play a bit of a role in Synchronicity and a bigger role in its sequels. What I find interesting about the fox spirits is that they weren’t like werewolves. Werewolves are humans who are forced into a wolf body during the full moon (in most werewolf mythology) or in cold weather (in the first book of Maggie Stiefvater‘s lovely Shiver trilogy). Fox spirits, however, are foxes who may take on a human form. In essence, they are the opposite.